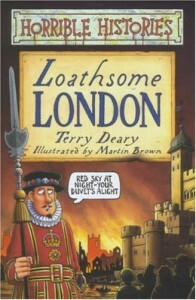 When visiting one of London's most loathsome places, The Tower of London, my sister and I came across this Horrible Histories book. As it happens we're big fans of the sketch show on the BBC - the type of fans that shamelessly sings all the songs while doing the dishes. This little booklet tells you all the gruesome stuff about London you want to know, perfect for when you're on holiday in London. I recognized some of the information given from the sketches, but there was plenty new gory details about London left. Last but not least; Richard III feels like history has treated him unkind, portraying him as a bad guy. Horrible Histories made this perfect song about it, how can you not feel sorry for Richard III?